Thanks for posting! Yeah, this was part of the Social Kingdom campaign from 2012. The Kingdom historical manga is now the Guinness World Record Holder for the "Manga Written by the Most People." Guinness recognized the world record on December 12. 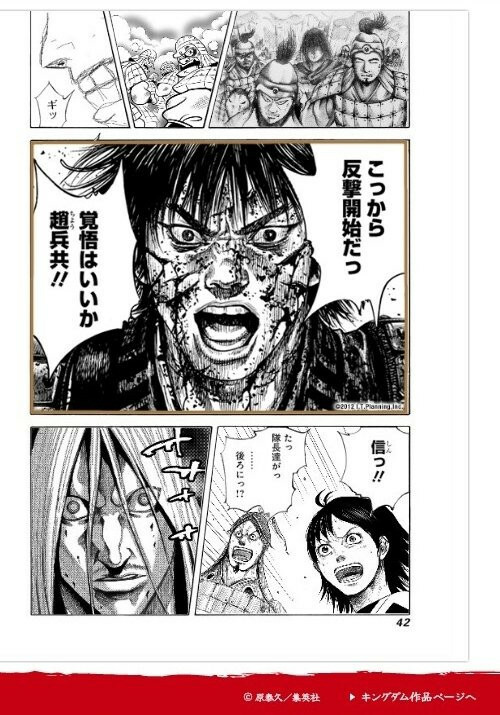 The "Social Kingdom" campaign had launched in May, tasking 1,000 fans and celebrities to redraw the 26th volume of Yasuhisa Hara's manga. A total of 1,087 people participated in the campaign, including manga creators Eiichiro Oda (One Piece), Masashi Kishimoto (Naruto), Hirohiko Araki (JoJo's Bizarre Adventure), Takehiko Inoue (Vagabond) and Hiroshi Motomiya (Salaryman Kintaro). Voice actors Masakazu Morita, Jun Fukuyama, and Rikiya Koyama, voice actresses Yōko Hikasa and Rie Kugimiya, and singer Etsuko Yakushimaru also participated. Each participant redrew one of the approximately 1,000 panels from the volume. The entire redrawn volume is available to read for free on the campaign's official website. The official certificate for the record will be on display at the Kingdom booth during the Jump Festa event in Chiba's Makuhari Messe event hall from December 22-23. The manga's story begins with Xin and Hyō, two boys without families in the Warring States Period when China has been embroiled in war for five centuries. Despite living like slaves, the boys strive to realize their dream of becoming warlords. Hara's manga has been running in Shueisha's Weekly Young Jump magazine since 2006, and the 28th compiled book shipped in Japan on November 19. The anime adaptation premiered in Japan in June, and Funimation is simulcasting the series in North America as it airs.